Doctors always recommend eating a well balance diet in order to satisfy the requirements in nutrients and elements for a proper and healthy functioning of the human body. Among these nutrients and elements, vitamin B rises as an important substance needed by the organism; this is due to the relevant role in the maintenance of cell health and the providing enough energy to the body. Moreover, vitamin B is a complex group that can be found in several types of food, such as dairy products and meat for vitamin B12, to fruits and vegetables for vitamins B-7 and B-9. As they are classified in several sub-groups, deficiency of this complex group would have different signs and symptoms according to the sort of vitamin B lacking from the system. Here are some of the signs and symptoms of the subgroups presented in the vitamin complex. • Vitamin B-1 and B-2, also known as thiamin and riboflavin respectively, are essential to turn food into energy. They can be found in food such as whole grains, milk, eggs and dark green vegetables. If confusion and cracks around the mouth are presented, they are clear indicators of the low levels of these vitamins. Especial attention must be given to alcohol consumers, since this legal drug can lead to a deficiency of both substances. • Vitamin B-3, called niacin, is also an energy extractor from food. Chicken, fish, liver, red meat, wheat and peanuts contain this element. If digestive problems as nausea and abdominal cramps are shown, the insufficiency of vitamin B-3 is clear. A severe situation of low levels of the substance can lead to mental confusion. • Pyridoxine, better known as Vitamin B-6 is another provider of energy obtained by ingestion of food; plus it is a helper in case of body infections. It can be found in chickpeas, tuna, salmon, whole grains, cereals, beef liver, ground beef, chicken breast, watermelon, potatoes, and spinach. Anemia is a result of the deficiency of this element, as well as some disorders in the skin like rash or cracks around the mouth. Depression, confusion, nausea, and infection predisposition are other of the signs of the lacking of the substance when the insufficiency is in high levels. • Vitamin B-9, also named folate or folic acid, is naturally found in meats, whole grains, beets, citrus fruits, fish, fortified cereals, legumes, green leafy vegetables, liver and kidney. It promotes the growing of red blood cells and reduces the risk of birth defects when it is taken by pregnant women. If diarrhea and anemia are observed, this could be a clear indicator of the substance low levels in the system. 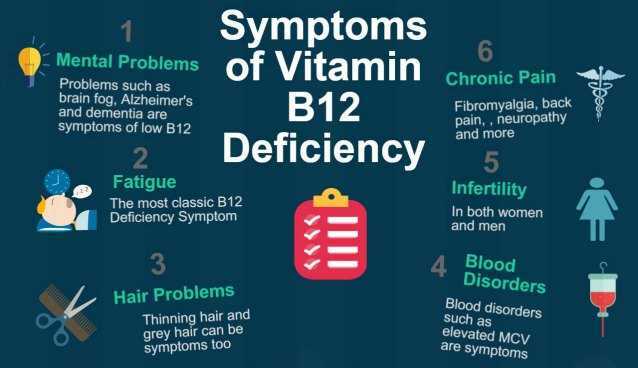 • Vitamin B-12, known as cobalamin as well, helps to regulate the nervous system and a relevant factor in the formation of red blood cells and in growth. Vitamin B-12 is contained in food like eggs, cheese, milk, fish, shellfish, liver, kidney, and red meat. If tingling in hands and feet is observed along with extreme fatigue, weakness, irritability or depression, this can be inferred as the insufficiency of this vitamin. Consult a doctor as soon as any of these signs and symptoms is observed, since the damage could be irreversible if the diagnosis is not done at the very early stages.